In 2005 I visited Japan as a 'dam removal ambassador' to transmit knowledge gained from the Matilija Dam project. My gracious hosts from River Policy Network provided many opportunities to meet others and speak about ecosystem restoration. Toward the end of the trip, one of my new friends said he had a gift for me. But first he had to explain. Since I understand no Japanese whatsoever, and his English is limited, he started drawing on a napkin. 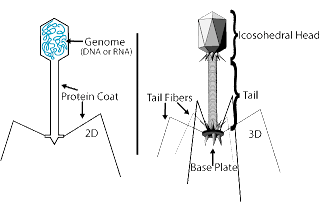 After much hand waving I recognized his sketch as a virus, and understood him to be describing viral replication, which involves synthesis of viral DNA. Hmmmm. He then handed me this. He went on to tell me that on his trip to Matilija Dam the previous year he had collected a piece of concrete from the crumbling structure. The 'virus' in the test tube was created using this 'DNA.' Recognizing Matilija Dam to be one of the world's first large dam removal efforts, he has made many of these to present to each of the dam removal activists he encounters. WOW. Dam removal DNA. A disease? Or an idea to be replicated? Social scientists have developed tools to describe this. 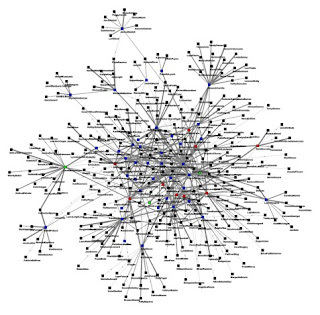 A social network map shows the connections that exist between people and/or organizations (nodes.) 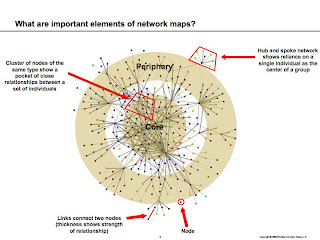 Network maps are a way of making visible and understanding relationships that are often otherwise invisible. The maps can show important features of the network that can be acted upon to leverage the network to produce better outcomes in the community. At a West Coast Ecosystem Based Management (EBM) Network meeting this year, a social network diagram was presented based upon an on-line survey that each participant had completed. Looking at the beginnings of a social network model for EBM I could envision my connections within the small community of awareness that is evolving within the Ventura River watershed, and the growing network of links that literally reach around the world. Here's one way of viewing it: as each of us 'infects' others with this 'DNA' we begin to build a critical mass. This increase in social awareness is the bare minimum that will be required to implement real-world changes to restore the global ecosystems upon which we depend for survival. As my gift from Japan demonstrates, despite cultural and language barriers, our DNA, our social network, reaches around the globe. Love seeing this project continue to expand our knowledge and expectations... great post.